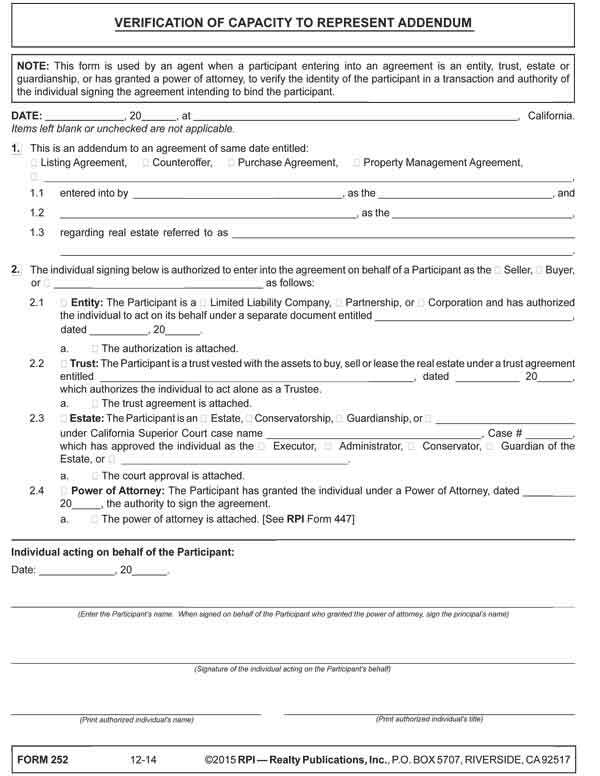 This form is used by an agent when a participant entering into an agreement is an entity, trust, estate or guardianship, or has granted a power of attorney, to verify the identity of the participant in a transaction and authority of the individual signing the agreement intending to bind the participant. encumber as collateral for mortgage financing [See RPI Form 104]. The person employed by a client to provide real estate services in expectation of a fee is a licensed real estate broker. Likewise, if a dispute arises with a client over the client’s failure to pay an agreed-to fee, the broker needs to be employed under a written listing signed by the client to pursue collection. A real estate agent employed by the broker may obtain a listing, but the agent does so while acting on behalf of the broker. The agent has no independent right to enter into or enforce the listing agreement in their name. The listing agreement sets the scope of services the broker is authorized to perform while representing the client. The listing also authorizes the broker to serve as the client’s representative in the negotiation of a real estate transaction with others. Further, the listing contains the client’s promise to pay a fee to the broker. This promise is given in exchange for the broker’s promise to use diligence in the broker’s efforts to meet the client’s objectives, known as fiduciary duties. Editor’s note — The use of diligence is distinguished from a “best efforts” standard for broker performance under an open listing. Though a written listing agreement is required to enforce collection of a fee, an oral agreement to perform brokerage services on behalf of a client imposes an agency law obligation on the broker and their agents to act as fiduciaries — no differently than had a writing existed. an owner or lender to mortgage a property. an exclusive right-to-sell or right-to-buy listing agreement [See RPI Form 102-104]. Both types of exclusive listings establish the broker and their agents as the sole licensed real estate representatives of the client. However, these variations are distinguished by whether or not the broker is entitled to a fee when the property is sold or located solely by the efforts of the client. Under an exclusive agency listing, the broker does not earn a fee when the client, acting alone and independent of any other broker or the listing broker, accomplishes the objective of the employment, i.e., selling the listed property or locating and buying the property sought. Brokerage services: The employment period for rendering brokerage services, the broker’s due diligence obligations and any advance deposits by the seller (Sections 1 and 2). Brokerage fee: The seller’s obligation to pay a brokerage fee, the amount of the fee and when the fee is due (Section 3). Conditions: Authority for the broker to receive a buyer’s purchase offer, accept a good-faith deposit, enter into fee-splitting arrangements with brokers representing buyers and enforce the listing agreement (Section 4). Property description and disclosures: Identification of the listed real estate and any personal property that is also being sold, the terms of existing financing and the conditions of the property (Sections 5, 6 and 7). RPI’s exclusive right-to-sell listing agreement affords a real estate broker the greatest fee protection for their efforts. Under an exclusive right-to-sell agreement, the owner relinquishes their right to list the property with other brokers or defeat the seller’s broker’s entitlement to compensation by selling the property themselves, as occurs under an exclusive agency listing or open listing. Exclusive right-to-sell listings give a broker and their agents the greatest incentive to fulfill their fiduciary duty and work toward attaining the client’s goal of locating a buyer who acquires the property. Here, the seller’s broker does not compete with the client to sell the property — they work together to achieve the sale. Buyer’s brokers know that sellers who enter into exclusive right-to-sell listings are fully committed to working with brokers. Also, sellers who retain competent agents are counseled on prices of comparable properties and current market conditions. Thus, the seller of a listed property is more likely to accept a reasonable offer. In turn, buyer’s brokers are comfortable exposing their clients to properties listed exclusively by other brokers. Form updated 05-2016 to include the RPI branding.